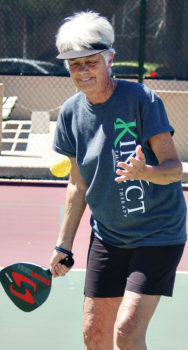 As she recovers from an ankle injury (not associated with pickleball), Margaret McCathern, a retired physical education teacher and SunBird resident since 2002, is just itching to get back on the courts. Dubbed by this writer as the “mother of SunBird Pickleball,” she has seen pickleball grow from a new sport/activity with four players in 2010 to one of the most popular activities at SunBird seven years later. “It’s a sport/activity that caters to all ages. I have seen residents out here with their friends, kids and grandkids. It allows players at any age to have fun and stay active,” Margaret said. Originally from Spokane, Washington, she retired after 27 years as a physical education, math and history teacher. She spent her teaching years at high schools in Hawaii, Vancouver, BC, and Washington State before retiring to Arizona in 2002 and has been a SunBird resident enjoying the weather, being outdoors and making new friends from around the country. The early days of pickleball at SunBird were fun but we had to quickly get organized, according to Margaret. “Back in 2010 when Marianna Buescher, Cindy Vig, Karen Gilmore and I first got together to play, we played on the tennis courts and had to use the nets and lines the tennis players used, but we had a great time,” she said. “It was not too long afterwards that other residents started showing interest. Some had experience playing back in the Midwest, East Coast and Canada. Before you knew it, we had a Pickleball Club.” The SunBird Pickleball Club has grown from four members in 2010 to over 100 players today. Margaret gives credit to the SunBird Recreational Committee, who, when she made the initial proposal to introduce pickleball and provide an opportunity for residents to have another option to live that active retired life which some were seeking, provided direction and support to allow SunBird pickleball to grow. Margaret also credits Marianna Buescher, SunBird Pickleball Board Chairperson, and the current SunBird Pickleball Board members (Wayne and Robyn Blosh, Dan Buescher, Pete Prucha and Alan Trudeau) with elevating the awareness and popularity of pickleball at SunBird. The board, along with a group of SunBird Pickleball Ambassadors (Greg Libby, Byron Watterud, Ed Henneck and Maureen Moore), are taking the game to the next level. They have organized fun events, an end-of-season party and fun tournaments and are always looking for new ideas. “They are working to serve the best interest of the community and want our residents to have options and have fun,” she said. “There is a lot of demand for the game, so working with other groups in our community, we can work together to best serve the residents. 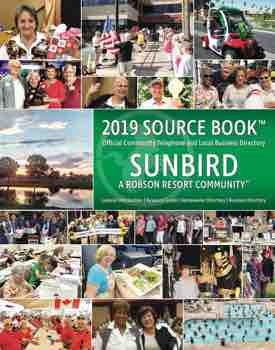 We may disagree sometimes, but ultimately we do what’s best for everyone.” She pointed out, during the winter months there is very high demand for all the activities offered to SunBird residents. The HOA leadership will work with the leadership from all the groups to provide the best environment for the residents. As Margaret completes the final stages of recovery from her ankle injury, she is excited about the upcoming pickleball season. She is also very interested in the growth of bocce ball. I guess it’s the physical education teacher in her that drives her to be always in search of activities that encourage good health, a strong heart, happiness and long life. Keep dinking, Margaret! Tuesdays and Thursdays from 2:00 to 5:30 p.m.
Fridays from 7:00 to 10:00 a.m.